Swimmers on average swim at speed of 2 minutes per 100 meters. Whether you’re faster or slower then this we know you want to get better with every training and every minute spent in the pool. That is exactly why we want to give you five simple ways you can improve your speed during swimming workouts. 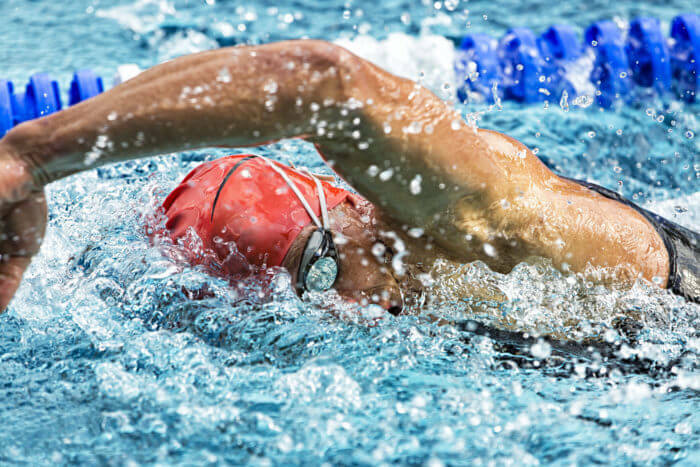 As all the other tips here this one is not about how strong you are as the right technique smoothes out your swimming using your strength in a much more efficient way. It’s about the drag – resistance that your body produces while swimming. To reduce it you can work on your balance or swim taller so that your swim is as fluid as possible. Kicks and Drill workouts are super important if you want to find success in the pool. Swimmo has a whole separate mode that helps you measure your metrics during kicks and drill workouts. And why are kicks so important for the speed? When done right – they will give you both balance and propulsion. Remeber that efficient kicks don’t break the surface but also don’t go to deep underwater! The secret is not really a secret but still, not many people know this unless a coach points it out. Your legs are giving you only 10% of the overall propulsion so your right hand’s and arms technique are very important to improve your speed. The way to think about it is you should focus on a powerful pull and your legs not interfering by creating drag. This one is mainly for freestyle stroke and it is very important in order to minimize drag. The trick is very simple to understand but still requires lots of training to master the skill and be consistent. You have to keep your body as horizontal as possible so that water goes around your body maximizing your speed! This one can really help you a LOT if you’re not doing it yet. Slightly spreading your fingers while pulling the water can result in over 50% more force by creating ‚an invisible web’ between your fingers. That can be a life-changer for you if done properly! And to see how your pace gets better and better you can use Swimmo and it’s pace tracking and guidance using PaceKeeper technology!